Please contact us with your application requirements for an alternative or check out our list of Non-Oxidising Biocides. Accepta 0502 is a highly effective organic biocide formulation based on THPS which also contains a powerful anionic surfactant designed to penetrate biofilms. 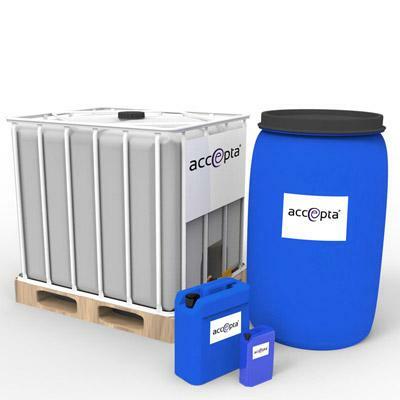 Accepta 0502 has been developed to enhance the rapid kill characteristics and broad spectrum activity in highly contaminated cooling water systems and closed systems where algae and slime dispersion are important objectives. Accepta 0502 has low foam characteristics and maintains full biocidal efficacy under both acid and alkaline pH conditions. Accepta 0502 provides quick kill times (often within one hour) against aerobic and anaerobic bacteria, Legionella pneumophila, pseudomonas bacteria, algae and fungi. It is also particularly effective against sulphate reducing bacteria, a major source of pipeline corrosion. 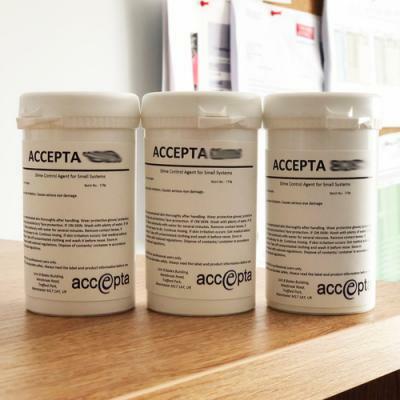 Accepta 0502 has a low toxicity and is readily biodegradable. It can also be deactivated under controlled conditions. High performance THPS based biocide with anionic surfactant. Very quick kill times (often within one hour). Kills bacteria, algae and fungi. Includes anionic surfactant for excellent biofilm penetration. Will control microbiological corrosion caused by sulphate reducing bacteria. Low toxicity and readily biodegradable. Accepta 0502 can be added at any point where there is good mixing with the system water. Accepta 0502 can be dosed proportionally or via a timer. Contact Accepta technical support for further information. In cooling water systems the standard maintenance dose of Accepta 0502 is 150 – 200 ppm on a weekly basis. This concentration will achieve effective Legionella control (laboratory test data is available if required). An alternate biocide is recommended to prevent the development of resistant organisms. In closed systems the dosage of Accepta 0502 will vary according to system conditions and problems being experienced. Contact Accepta technical support for further information.